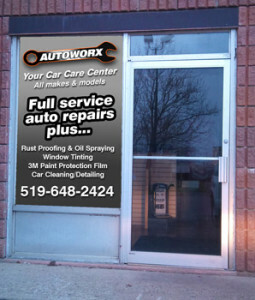 Autoworx is proud to serve the Breslau, Guelph, Cambridge, Kitchener-Waterloo and surrounding areas. Autoworx, located in Breslau, Ontario, is a family owned and operated full service auto car repair and rust protection facility for most makes and models of vehicles. Our auto repair and maintenance services include oil changes, transmission systems, mufflers & brakes, air conditioners, tune-ups and suspension systems. In addition Autoworx also provides appearance protection services including oil spray and permanent rust proofing and 3M paint protection stone chip film. Service is done by our friendly, highly qualified and licensed personnel using state of the art tools and equipment. We stand behind all our work. 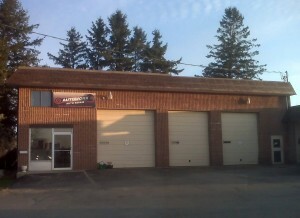 Autoworx is also a ministry approved motor vehicle inspection station serving Kitchener Waterloo and surrounding area. Autoworx is committed to serving you, our customer, with professional car repair and rust protection at a reasonable cost. We only use quality parts and materials along with genuine brand names you can trust. We stand on sound business principles and uphold high ethical standards. Our goal is to make your experience friendly and successful. Autoworx stands behind their work.